Sharda Letex Chemicals Pvt. Ltd. 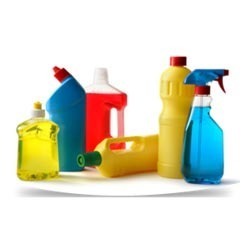 Cleaning agents are substances, usually liquids, powders, sprays, granules that are used to remove dirt, including dust, stains, bad smells, and clutter on surfaces. Purposes of cleaning agents include health, beauty, absence of offensive odor, avoidance of shame, and avoidance of spreading of dirt and contaminants to oneself and others. Some cleaning agents can kill bacteria and clean at the same time. S 6 Toilet bowl to remove germs & stains Ready to use Flush the toilet bowl. Gently squeeze the sapon 6 bottle to direct product under the rim, around the bowl. Allow at least 10 minutes contact time, use a brush or sponge pad to remove difficult stains, then flush to rinse. S 2 Hard surface, shiny floor, polished marble, tiles, granite Add 10 - 20 ml of product per 5 L water into a bucket. Use a sponge, cloth or wet mop to apply the solution and to clean the surface. Rinse with fresh water or wipe with a damp cloth/sponge or wet mop. S 3 Glass, tables, chairs, Formica, windows, cabinets, porcelain, ceramics Ready to use Spray small quantity. Wipe clean with dry lint free cloth. S 5 Area where one need freshness Ready to use Small rooms: Spray once or twice upwards into the centre of the room. Large rooms: Spray proportionately more upwards into the centre of the room. S1 For floor, sink, wall, urinal, tiles Add 10 - 20 ml of product per 10 L water into a bucket. Use a sponge, cloth or wet mop to apply the solution and to clean the surface. Rinse with fresh water or wipe with a damp cloth/sponge or wet mop. S4 Used on surface of tiles in kitchen. Use 10 -20 ml to 10 liters of water Use a sponge, cloth or wet mop to apply the solution and to clean the surface. Rinse with fresh water or wipe with a damp cloth/sponge or wet mop. Conc. Detergent For floor, sink, wall, kitchen table Add 10 - 20 ml of product per 10 L water into a bucket. Use a sponge, cloth or wet mop to apply the solution and to clean the surface. Rinse with fresh water or wipe with a damp cloth/sponge or wet mop. Manual Dish Wash For crockery, cutlery, utensils, pots, pans. Use 20 ml to 20 liters of water For more heavily soiled items, higher concentrations may be used. For more heavily soiled items, higher concentrations 20 liters of may be used. Chemicals at highly competitive prices to bring out the best. As a company committed to quality, performance, precision and efficiency, we, Sharda Letex Chemicals Pvt. Ltd., introduce ourselves as a firm committed to provide nothing short of the best to our clients. Engaged as a manufacturer of a gamut of products, our bouquet comprises of a variety of Textile Auxiliaries, Leather Auxiliaries, Dispersing Agents, LABSA, TRO, DOSS, Agro Chemicals, Oil-field chemicals etc. We are equipped with the latest technology and keep ourselves updated through our R&D endeavors. We customize products according to the specific requirements of our valued clients. We started in 2000, as manufacturers of leather and textile auxiliaries and we got LE-TEX in our name Sharda Letex Chemicals Pvt. Ltd. Since then, we have got into agro chemicals, oil field chemicals, construction chemicals among other.